It's time for the Rangers, Alain Vigneault and co, to get Rick Nash off of the PK, and let him play his minutes 5v5 and 5v4 where he can be more effective. It may come as a surprise to some, as Nash's PK ability has been heralded since Babcock used him there in the 2010 Olympics, but no Rangers forward has been on the ice for more goals against on the PK, no forward has a higher GA/60, only Kevin Hayes has a worse xGA than Nash. Is that totally the fault of Nash? Of course not, but, it is concerning, and it begs the question if he's doing more harm than good to the Rangers on the PK. And this needs to be considered along with the detriment to Nash's 5v5 time, where he's consistently proven to be one of the league's most efficient goal scorers. Including this season dating back to 15-16, Rick Nash has skated 1,907 5v5 minutes, roughly 12.46 minutes per game and scored 25 goals. Sounds low, but consider that this ranks 4th among all Rangers forwards in those three seasons that meet a 1000 minute minimum (Grabner, Kreider, Brassard). If there's something that Nash doesn't have to prove, it's his ability to score goals. What should shock you most about the paragraph above is that Nash only averages 12.46 minutes a game of 5v5 time on ice. That is not enough, and I think part of it is because he is an all-situations player for the Rangers. I think it's time that Nash, now 33, spends no time on the PK and instead gets his minutes in during 5v5 and PP time. Nash gets the 5th most TOI per game during 5v5 play on the team. If you're using TOI as your identifier, these are borderline second-line minutes. It's not enough. This is pretty typical for AV. The TOI splits are closely bunched. AV doesn't "run his horses" at even strength, and tends to distribute the ice time. This is a good visual to display, at least, the players that AV has no idea what to do with, those being the players with wide distributions. Carey, Desharnais, Vesey, Grabner, and Buchnevich (somewhat), ignoring Boo here because his left-tail was the game he was injured in. Spread on Holden is interesting. Basically splits between third-pairing and being McDonagh's partner. Still cool to viz. These might be better as data tables than as viz's, but, here we are. It's not as exaggerated as I'd like it to be, but you can see the Babcock Leafs are clearly riding a few players more than others. Matthews, Nylander, Kadri, Marleau, seem to be tightly at the top. Tyler Bozak (42) has a very interesting, small-spread, with a sharp peak indicating that his ice-time is pretty consistent, as are the 'depth guys', Dominic Moore and Matt Martin. Point being, it's somewhat easier to indicate usage from the TOR chart than it is the NYR chart, and that's because AV spreads the ice time. It's important to get Nash that 5v5 ice, and less important to get him that PK ice. He's not really doing anything to help the Rangers 4v5. He's getting pounded by goals against (again, probably not entirely his fault, but he's on the ice for them, so who would be worse in this position? ), and it eats at his potential 5v5 time. It's also important for AV to start riding guys more. 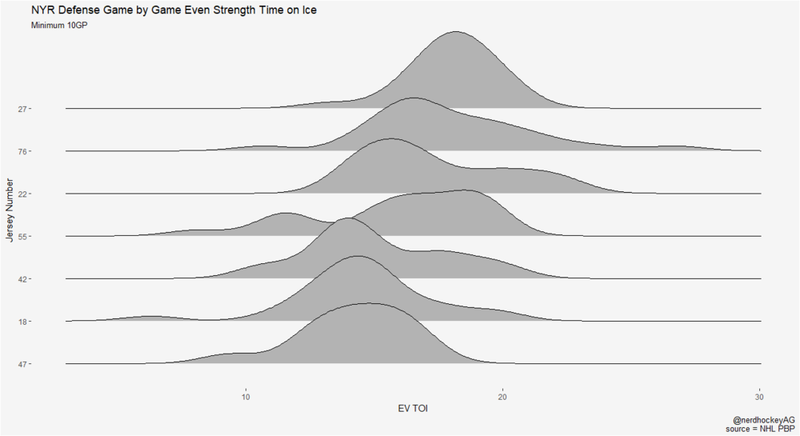 There needs to be a heavier discrepancy in 5v5 TOI between the top-guys and the depth. One major issue with this, is that AV doesn't trust the depth to do the PK'ing. The bottom 3 players for NYR even strength toi/gp, Carey, Boo, and Desharnais, have combined for just 8.8 minutes of total PK time. They're not even on AV's, or Lindy Ruff's (who runs the PK), radar. I'm all about playing your best guys, but there's something that irks me about depth-players who can't PK. If they can't PK, and aren't really contributing offensively at 5v5, well, then why are they on the team? (This doesn't really apply to DD51, who has seen some good scoring when given quality wingers. I expect this will be short-lived, and he'll be back to the days where AV isn't sure how to use him when MZ93 returns to the lineup). So what's the fix here, and why is it important? Well, the easy fix is to just start giving guys like Nash, Kreider, Buchnevich, Zibanejad (when healthy), and Zuccarello, the bulk of the EV TOI. These are your horses, and you should ride them. Back to Nash, specifically (and back to Corsica.Hockey, 5v5 data for that matter), he may not be the possession driver that he used to be, but he is still the active shooter that the Rangers need him to be. Nash is 2nd on the team in indivdual shot attempts for per 60, and first in total shot attempts. Nash is 5th in both individual expected goals for 60 and total expected goals. Let's see if we can work the lineup (ie. Nash off the PK and more time 5v5) to give Nash the opportunity he needs to be the 25 goal scorer that the Rangers need him to be.